50/50 Cauli-Brown Rice Fried Rice! 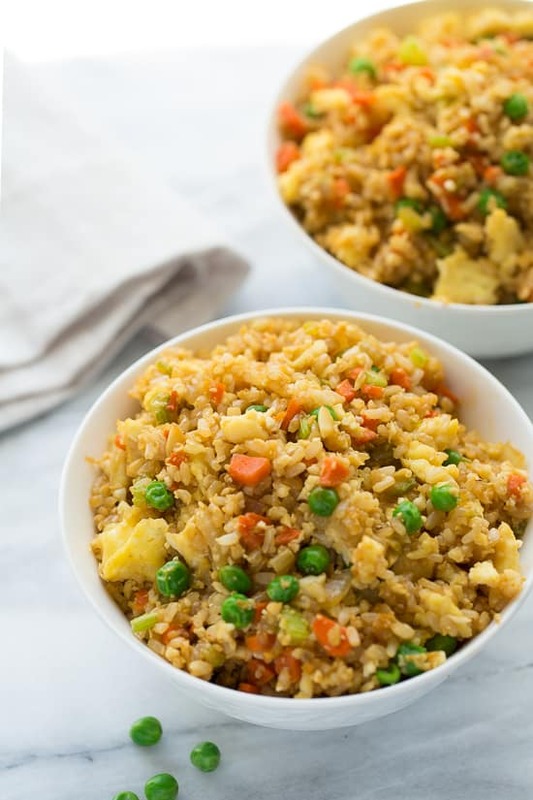 An easy fried rice made of 1/2 cooked brown rice and 1/2 cauliflower rice. 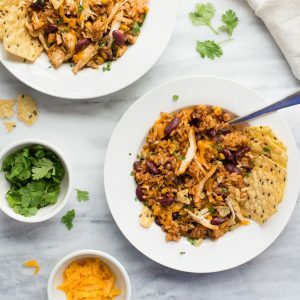 One of my go-to healthy dinners! 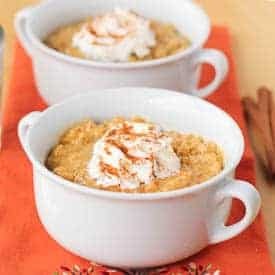 Easy, kid-friendly, yummy. I love the idea of the cauliflower rice, but sometimes I’m let down by the texture of straight cauli-rice. 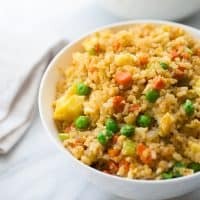 This easy fried rice made of 1/2 cooked brown rice and 1/2 cauliflower rice has become one of my go-to healthy dinners! You get the nutty flavor and light texture of rice along with an extra boost of vegetables from the cauliflower rice. Cauliflower is a cruciferous vegetable. Cruciferous vegetables have it all in the veggie world: vitamins, fiber and cancer-fighting phytochemicals. Regularly including cruciferous vegetables in your diet like kale, broccoli and cauliflower can lower your risk of many diseases. 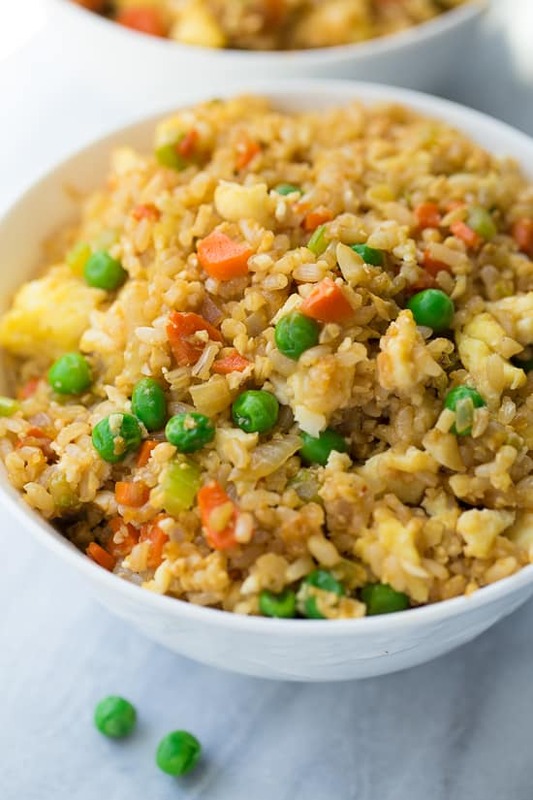 I try to get 2-3 servings a week, and this fried rice is a great way to get some of those servings in! 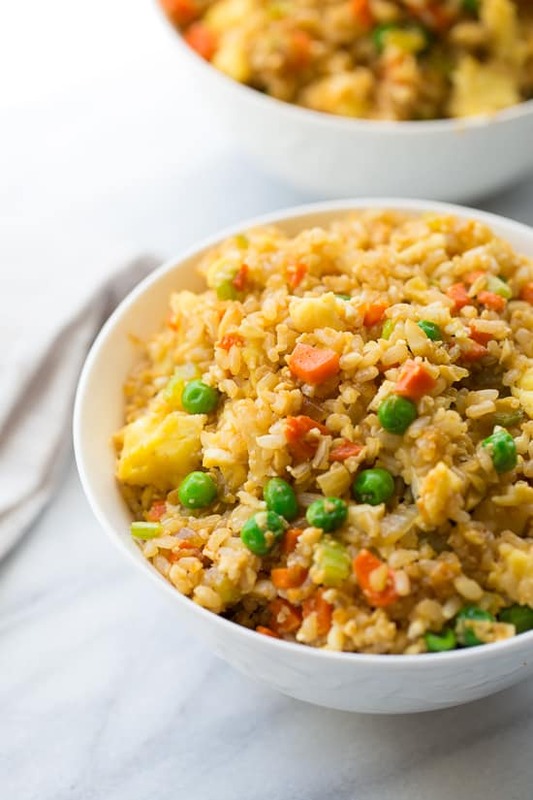 This fried rice is delicious leftover so I always make a big batch and keep it for lunches during the week. It is a whole meal on it’s own or would be great with another protein. I like using this sprouted brown rice, because the sprouting process makes the rice easier to digest and quicker to cook, but any rice will do! This is also a really kid-friendly dinner at my house. My boys love anything with soy sauce, peas or scrambled eggs. So this is always a real winner! You can buy riced cauliflower at Trader Joe’s or make it yourself. To make it yourself, place 1/2 a head of cauliflower that has been chopped into large florets in a food processor. Pulse until it is finely chopped. (see the video) You might have to pull out large pieces that don’t get all the way chopped and pulse them again separately. The leftovers from this are delicious and make great lunches! This recipe calls for cooked brown rice so make sure to plan ahead. My favorite brown rice is this sprouted brown rice. Whisk the eggs together with a pinch of salt until smooth. Cook in a large non-stick skillet over medium heat with 1 tablespoon coconut oil until just scrambled. Remove from the pan and place on a plate. Wipe the skillet clean. Heat 2-3 tablespoons coconut oil in the skillet over medium-high heat. Add the onion, celery, carrots, salt and red pepper flakes. Cook for 10-12 minutes, until softened, stirring often. Add the garlic and cook for 30 seconds. Add the brown rice and cauli-rice. Cook for about 5 minutes, until heated through and the cauli-rice starts to soften. Add the peas and tamari and cook for another 3-5 minutes. Stir in the cooked eggs, breaking into bite-sized pieces if needed. Serve and enjoy! Leftovers keep great in the fridge for up to 5 days. MAKE IT SOY-FREE: Use coconut aminos instead of soy sauce. Great idea to just use half and half! I was wondering if you know the nutrional info? I just made this, it was super tasty! I love the mixture of cauli rice and brown rice. Thanks for a great recipe! Frozen riced cauliflower can also be found at Kroger. I made this today! I cannot have eggs, so I did have to leave them out and it is still delicious. I used the coconut aminos and it was perfect. Do you think I can use tofu instead of eggs ?